Thanks for coming. It was fun gifting people. Edited by DoentMatter2U, 25 February 2017 - 07:47 PM. Wow so sweet of you guys! This is nice. Looking forward to this. 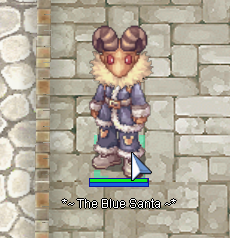 Cant log in to take a screenshot of the santa's IGN name but will do so as soon as the server is up! Look for this santa. Deal at sight! Starting the first round in 10 minutes! Update 1: Starting from round two, we will hose the event in Izlude now. Make sure you bring butterfly wings! thanks for the first round, Blue bro! Edited by trainerblue, 23 February 2017 - 11:19 PM. Fourth round at 4 am PST Saturday 25th! Edited by DoentMatter2U, 24 February 2017 - 03:26 PM. Update 3: Round 5 time will be moved two hours later!!! So instead of 12 pm PST, the event will start at 2 PM PST instead. Sorry for the inconvenient but none of us have time to log in iRO. The person who is supposed to be santa suddenly has an emergency.